Gimuy (Cairns) Peace Pilgrims will hold a “pop-up” concert outside the Australian Federal Police on Sheridan St at 11:15am on Friday. The Peace Pilgrims are protesting to expose the AFP for providing training and weapons, free of charge, to security forces in Indonesia. Those same forces are involved in killing civilians in West Papua. 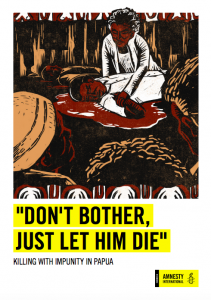 Amnesty international has released a report showing 95 people have been killed, most of whom are Melanesian West Papuans – the First Nations people of Papua. Three sets of special forces are trained by the AFP: Brimob, D88 and Kopassus. All have been implicated in extrajudicial killings, other torture and extreme violence against victims — including children. Media gathering from 11.15am Friday at AFP on Sheridan/Airport Drive.